Booklet published by Liberator, 60 pages. A5 size booklet (N4105P1). 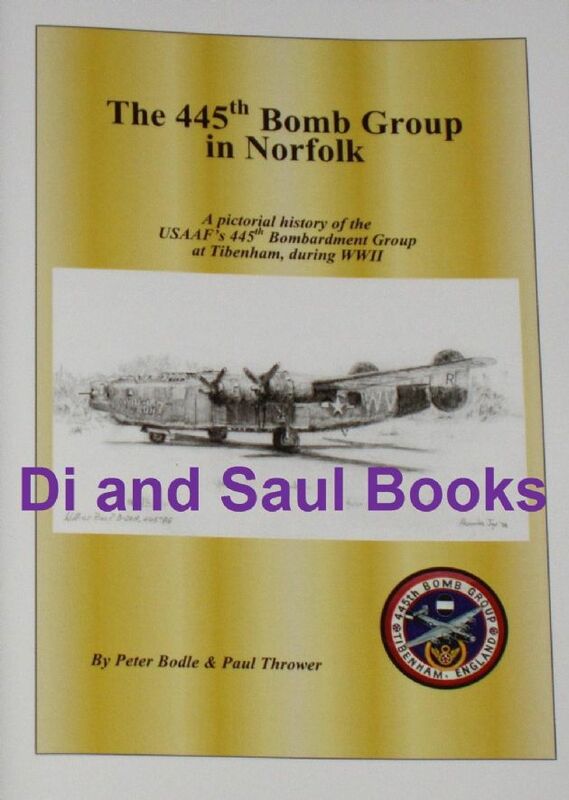 The 445the Bomb Group were based at Tibenham in Norfolk, thirteen miles south of Norwich, during the Second World War. Tibenham was very close to the airfields at Old Buckenham and Fersfield, and the 445th arrived in Norfolk during early December 1943. From then on they bombed continuously through to the end of the war (completing over 7,000 sorties! ), and sustained particularly heavy casualties during the Kassel raid on September 27th 1944. This booklet is one of a series from the publishers detailing the life and times of American servicemen who were part of the United States Air Force stationed in Norfolk during the Second World War. Each booklet is packed full with photographs, and most of these photo's were taken by serving airmen with their own cameras. Some of the photographs were official, some were semi-official and many were very much un-official, and together each booklet provides a fascinating insight into the airfields, men and planes during the war. Each booklet is printed on high quality glossy paper, with a full colour card cover, and the rear side cover depicts some of the colourful jacket patches of the various operational squadrons. Condition of the booklet is generally excellent.